Make yourself at home in one of the 4 guestrooms. Conveniences include irons/ironing boards, and rollaway/extra beds can be requested. Award-winning Ballindrum Farm is set in an area of rural beauty on the outskirts of Athy, County Kildare. The working dairy farm offers comfortable bed and breakfast accommodation with free guided tours of the farm available on request. Guests will be greeted by the welcoming hosts with tea, coffee and home-made scones. There are five en-suite bedrooms that are clean, comfortable and tastefully decorated. Guests are free to use the music room and TV lounge to relax in. A delicious breakfast is served each morning in the dining room. Farmstay Experience Ballindrum Farm in Kildare is a working dairy farm. Guest are welcome to watch the milking of the cows and the Ballindrum Farm method of farming is explained and guest questions answered. Children enjoy a visit to the calving shed to meet the new born calves. The hens have their own run beside the farmhouse, guests can feed them and collect the eggs. Agricultural groups are catered for that require a more technical visit eg. grassland management, herd yields etc. 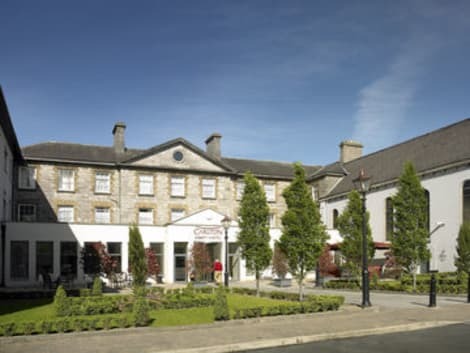 lastminute.com has a fantastic range of hotels in Athy, with everything from cheap hotels to luxurious five star accommodation available. We like to live up to our last minute name so remember you can book any one of our excellent Athy hotels up until midnight and stay the same night.